On everything related to food, health and even sleep. Let’s be honest, the first couple of weeks after having your little one – you’re probably sleep deprived, stressed and sorta obsessed with your baby. But your newborn is also feeling all sorts of things about being brought into the world – they’re hungry, uncomfortable and not used to the new environment. They’re also suuuuuper cranky if they don’t get a good night’s sleep…and it’s understandable why they would be. Newborns need almost 20 hours of sleep a day to develop healthily and grow with time, so anything less than that is a recipe for disaster. The best way to start a sleeping routine with your newborn is to bring order into your schedule. Make sure you make a routine that can be repeated on a daily basis and this will get your newborn used to sleeping once the routine is completed. Perhaps make a schedule that includes a bath, a massage, a lullaby song and then attempt to put them to sleep. These repeated activities will wire your baby to fall asleep by the time you’re done. Your baby may not get enough sleep a day because this is a whole new environment – different feelings, different sounds, different senses etc…. So try to introduce sounds that your newborn is already used to! Basically, anything that can be white noise or “background noise” – however, make sure it’s not too loud or too close to your newborn…just enough so that they can hear it and fall asleep peacefully. You can also use the familiar sound as part of your sleeping cues. Getting your child accommodated to the surrounding environment is extremely important – your newborn’s senses are heightened as they try to familiarize themselves with the environment. Therefore, it’s best to make sure that the environment about them is of a soothing, calming and cozy nature. Make sure the room they are sleeping in is not too cold or too warm – the ideal temperature should be between 69 and 73 F.
You can also attempt to swaddle your newborn to keep them warm and cozy – but make sure the clothes are breathable and comfy for them to fall asleep in. 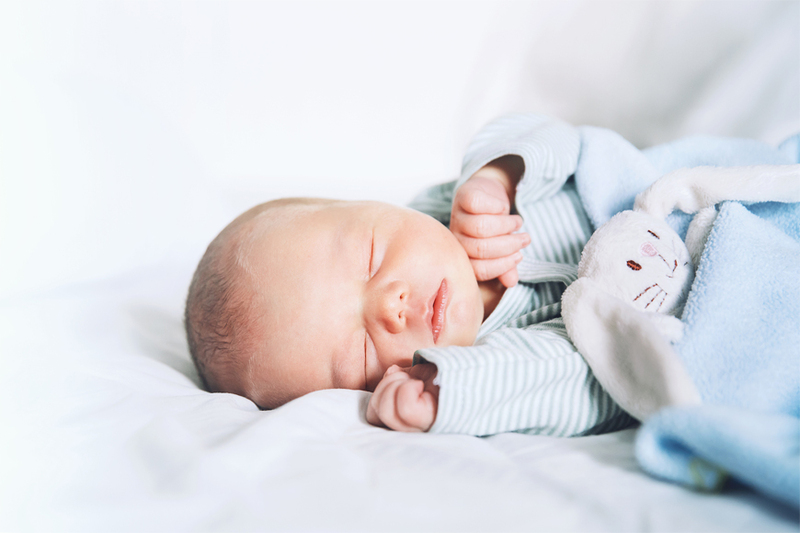 While it may be tempting to let your newborn sleep in all day – this will only keep them up at night and mix up the sleeping schedule for both of you. So attempt to limit the number of naps during the day because you’ll want your newborn to start associating the nighttime with sleeping time. Try to stay between 3-4 hours of napping a day and try not to force your baby to fall asleep by mimicking a night environment either. Your baby is ultimately the boss of their own sleeping schedule, while some things may help, they’ll decide when it’s time for some Zzz.